One of our finest chroniclers of climbing tells us what we need to enjoy North America's most spectacular hikes. Potterfield's writing is elegant and engaging: Open "Classic Hikes of North America" to any page and see if you don't feel you're already out there. Forget the hype about the new "extreme" sports; mountaineering has been around for centuries and is clearly the most extreme of all. It's hard to beat Peter Potterfield's harrowing In the Zone, an account of three deadly climbs. Peter is the best informed, the most complete, readable and exhaustive hiker in North America... This tome is invaluable. Poignant, and horrifying . . . . A journalist and able story teller, Potterfield recounts three harrowing tales: Colby Coombs' struggle to live after a deadly avalanche on Alaska's Mount Foraker in 1992, Scott Fischer's near-death experience on K2, and his own fall and nail-biting rescue that followed. Fischer's experience is arguably the most compelling, as Fischer is dead and the climbing world wants to understand why. With its thorough research, accessible information and stunning images, this book makes me long to get out into the wilds of America, and walk! Potterfield's matter-of-fact style gets you right into the climber's head. I loved this story and could not put it down. Potterfield does a good job of mixing direct quotes with his own insights . . . . [He] captures the dangers of climbing, but even more interesting are his insights into the mentality required for such extreme risk. In The Zone chronicles some of the greatest mountaineering survival stories ever told. Like a great novel, we emerge from our experience transformed, with a new reverence for the limits of human endeavor and will. Potterfield takes us to a place climbers hope never to visit, where the hold on survival is tenuous. A compelling, troubling look at the dark side of mountaineering. Writing from the soles of his feet and the bottom of his heart, Peter Potterfield delivers equal portions of inspiration and practical information Turn a few pages, and readers will find themselves looking to a calendar to set dates for the 25 hikes detailed in this magnificent book. The story of Potterfield's fall off Chimney, and his now-legendary helicopter rescue, anchored 1996's "In the Zone," his collection of horrendous climbing-accident stories, and highlights the everyman persona that makes Potterfield's writing so accessible. Few people have wandered as many spectacular places around the world as Peter Potterfield... Brought to life with beautiful photography, rich descriptions and practical details to guide almost anyone, every page of Classic Hikes inspires wanderlust. The days are longer, the sun is warmer and more than a few Canadians will soon be hunting through their basements for backpacks, camp stoves, sleeping bags and other gear needed for an outdoor adventure. And if all that's missing is inspiration, they should pick up a copy of Classic Hikes of the World . . . An amalgam of a coffee-table beauty (the glossy colour photographs are gorgeous) and a practical guide, Classic Hikes is a book to hike by and one to dream by. There's nothing like a long walk to see nature up close. Journalist Peter Potterfield draws on his own travels to detail 23 routes, gauge the difficulty of getting there, and supply superb photographs of these far off places. Peter Potterfield's latest book, Classic Hikes of North America makes you want to quite your job, lace up our books and head to the mountains. Packed with awe-inspiring photographs, handy tips and elegant writing, Classic Hikes of North America gives you a good idea of the many unexpected pleasures on the trail. Every explorer and arm-chair traveler needs to buy this book. Classic Hikes of North America delivers expert information on the best trails, when to go, and what you'll see - all beautifully illustrated with detailed maps and Peter Potterfield's iconic photographs. Author Peter Potterfield has spent more than 30 years hiking the world's wildernesses, and the loving care he lavished on "Classic Hikes of the World" is evidence that each trip has been a pilgrimage. Big, sharp photos  from Denali National Park in Alaska to the Fitz Roy Trail in Argentine Patagonia  offer ample incentive to keep turning the pages. Readers will be glad for Potterfield's engaging descriptions and advice. "Classic Hikes of the World is a wonderfully informative book. It has all of the necessary information to explore and enjoy some of the most beautiful and inspiring terrain on the planet." For those of us who yearn to explore North America's glorious backcountry, Peter Potterfield's impeccably researched book provides a perfect resource from which to plan the remainder of our hiking lives! Breathtaking, yes. And beautiful, beguiling, beckoning... Peter's new collection of Classics is sure to be on the top of every hiker's pack list!" "If I could own just one guide book for hiking, Peter Potterfield's refreshingly well-written Classic Hikes would be it--and it would keep me busy for the rest of my life." Part pretty-picture book, part trail guide, this handsome guide to 23 of the planet's best walks is . . .lavishly photo-filled. It's easy to imagine an ambitious outdoorsman paging through and using Potterfield's impressive expertise to plot out his backcountry to-do list for years to come. Written with firsthand experience and including practical tips and precise maps, the book is a bible for anyone with a sense of adventure. Classic Hikes of the World is a beautifully produced and illustrated book . . . but it is more than just another addition to the armchair traveler's library. By combining knowledge gleaned from a lifetime of trekking through some of the world's most beautiful natural spaces, with in-depth information on how to follow in the author's footsteps, Classic Hikes will entice many a reader out of his chair. Classic Hikes proves to be an antidote for those wanting to blend wanderlust with simpler activities. For outdoor lovers, the 224 page volume is a mouth-watering package of stunning photographs and descriptions of what Potterfield considers the greatest backpacking trips on the planet. . . And history would suggest that Potterfield knows his audience. "Peter Potterfield is the ultimate guide; he steers us down wild trails in magic boots, lighting the hidden paths and secret sights, vividly illuminating in great detail the logistics, hazards and strategies to tramp among the wonders of the world. This is a dream book, a catalogue of classics, of all the walks to do before we die. I'm lacing up and stuffing this book in my pack to begin this delightful step down the finest paths, in the footsteps of the master." "Far from being a remote adventure, high altitude mountaineering is now a spectator sport. . . MountainZone.com has done more than any other site to move climbing into the virtual world." Expertise and personal experience meet in these three harrowing tales of close calls in the mountains, from a veteran mountaineering writer. Tense and descriptive. . . a trilogy of true accounts of near-death experiences. 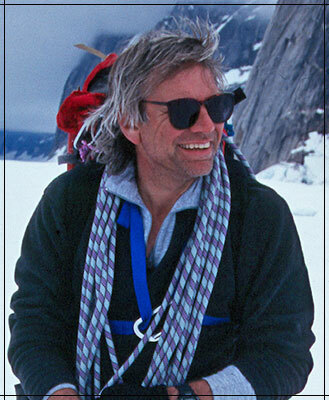 Journalist and climber Potterfield shows Scott Fischer at his courageous and athletic prime. . . that foreshadows this year's Everest deaths. For the reader, it is a mixture of fascination and agony. In the Zone is riveting reading . . .
A white-knuckle volume of gruesome stories . . . . Not for the squeamish, these are harrowing tales of broken survivors dangling beside corpses, of shattered bodies inching along for miles in blinding agony, of confident expeditions from which only one climber returns. In the Zone is a masterful account of three extraordinary humans and a fascinating depiction of the struggle for survival . . . a gripping trilogy. Three contemporary survival stories, one of renowned guide Scott Fischer who was not denied the summit of K2. Such tenacity in the face of danger typifies Potterfield's prose style, also infusing his other tales of survival. Armchair mountaineers will discover here insights into why mountaineers take such risks. The message from these stories of human drama is clear: think and choose before the climb, not at the onset of trouble.